Art & Frame of Sarasota: We Carry Escoda Prado Travel Brushes! We now carry Escoda's Prado Synthetic Sable Travel Brushes - a more cost effective way to experience Escoda's Travel Brushes! Prado Synthetic Sable Brushes are made with synthetic fibers that are very similar to sable hair. The synthetic fibers imitate the properties (color, spring, and the ability to absorb liquids) that artists look for in a sable brush. Escoda takes this similarity even further by using a combination of three different diameters and three lengths of fibers to create a brush with the same brushstroke result as one made with natural sable hair. The travel brushes come with a cap that extends the handle for convenient use. These beautiful brushes are perfect for anyone who likes to work outside their home or studio. Find Escoda Travel Brushes here! 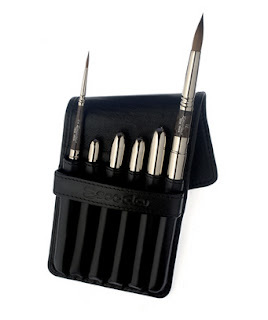 Learn more about Escoda brushes by watching the video below!